Updated and enhanced version of a lecture paper, held on May 9th 2010 by Stephan Puille, Berlin at the 11th International Conference of Discography (“11. Diskografentag”) in Hildesheim. In the forenoon, the phonograph was reserved for important artists and academics, to make the instrument known and, of course, to make recordings, which Wangemann afterwards performed to notables for free, and at public gatherings against payment. Six persons could always hear the phonograph at the same time through earphones. Demonstrations with mounted horn were also performed occasionally, but the sound was less true to the original, being much lower and metallic. The visit of Johannes Brahms at the Vienna Grand Hotel on October 30th, 1889 was especially highlighted by the press. (2) Brahms heard, among other things, an aria sung by Lili Lehmann, a spoken telegram by Werner von Siemens and a piano piece. Filled with enthusiasm he wrote to Clara Schumann: “It’s as though one were living a fairy-tale” (3), and presented Wangemann a dedicated picture of himself. Three days later, the mezzosoprano Rosa Papier recorded Brahms’ “Sapphische Ode”, which was soon afterwards performed to the Austrian Emperor Franz Joseph. A press report mentions the recording of some of Brahms’ dances by the famous pianist Alfred Grünfeld with a newly introduced funnel on November 14th, 1889, which was mounted at the underside of the instrument. (4) On December 2nd, 1889 a few days after a private gathering at the house of Dr. Richard Albert Fellinger, the head of the Vienna branch of the important firm of Siemens & Halske, Wangemann came back to demonstrate some of his latest cylinders and to record Johannes Brahms, as arranged with him before. The cylinder, presented by Wangemann to Dr. Fellinger on this evening, was long forgotten by the public when his son Richard Fellinger noted in his memoirs that it was extremely difficult to reproduce, because the sound was too weak and, despite of several attempts, a suitable method hadn't yet been found. (6) Obviously the cylinder was played more than once on a phonograph the family had bought for that purpose. Early cylinders are comparatively soft, requiring a lightweight reproducer like the Edison “Standard” speaker, and are usually reproduced by earphones. The family members certainly had no clue about such technical refinement. I am sure they employed a common Edison phonograph model with a heavy “Automatic” or, even worse, a “Model C” reproducer and stressed the groove with each play-back. Later, the phonograph was equipped with an electric reproducer, but the damage was already done. The course of events in January 1935 is controversial. Ludwig Koch, director of the culture department of Carl Lindström AG (see figure 2), claimed that Fellinger approached him, asking if he would try to improve the recording by transferring it to disc. 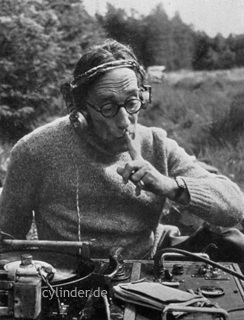 (7) Fritz Bose, director of the newly created music department of the Institute for Sound Research at the University of Berlin, which was founded on April 1st, 1920 by Wilhelm Doegen as Archive of Sound, told another story. Thus Bose had discovered the Brahms cylinder and written Fellinger on January 12th, 1935 for his approval to dub the cylinder to disc, to which the same had consented four days later. (8) Be that as it may, Fellinger handed over the precious cylinder, padded with cotton wool, in a special box manufactured of mahagony and crystal glass. When he was a boy, Ludwig Koch had met Johannes Brahms who told him about the cylinder of 1889, but the famous pianist did not know what became of it. Naturally, Koch was extremely curious about the recording, but wrote in 1955 that the piano could hardly be distinguished through the loud noises due to inexperienced recording. (9) This was a posthumous slap in the face of Wangemann, responsible for Edison’s recording department since 1888, who had died 1906 in a train accident. Despite the shortcomings, the cylinder was important enough and Fritz Bose exploited its rediscovery and transfer on disc in the national press. 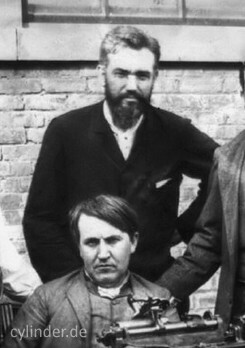 Ludwig Koch was responsible for the transfer by means of either a microphone put up in front of a phonograph horn or, more likely, an electric pick-up applied on an Edison phonograph. The signal output was amplified and filtered from disturbing noises before it drove a cutting head to inscribe the sound on Draloston disc. (11) This recording medium, an aluminium disc coated with a thin layer of lacquer, had been manufactured since 1932 by the Dralowid plant in Berlin, Pankow. The lacquer was soft enough to be cut and less fragile than wax. After hardening in an oven for two hours it could be replayed a number of times. The small monogram “OB”, an acronym for Lindström’s recording engineer Otto Birkhahn (12), followed by the sequenze number “9” is carved in the dead wax under the serial number and the letter “P”, which has yet to be interpreted (see figure 3). Birkhahn transferred the sound recording from the Draloston disc, completed with a spoken introduction, to the wax master. By electroplating the wax master, a stamper was created to press a small number of shellac discs. All had a paper label of the Institute for Sound Research with handwritten information. Instrumental recordings like the Brahms disc got an orange label, voice recordings a green label (see figure 4). 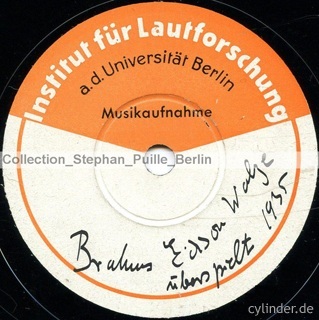 (13) The German inscription reads “Brahms Edison Walze überspielt 1935” (Brahms Edison cylinder dubbed 1935). On December 20th, 2010, I heard at the Berlin State Library a transfer of both Telefunken shellac pressings on DAT tape, with the sad conclusion that the original 1889 recording had gotten much worse in the short period between 1935 and 1938. Only fragments of both the introduction and Brahms’ piano playing, disturbed by numerous pops from cracks, could be identified. Besides physical damage by breakage, the cylinder was obviously played once more with the wrong reproducer before the small remnants were again dubbed on disc.